Pronouncements on plans for stronger Russian military forces in the Arctic have been studiously ignored on these pages. For two reasons . . . first, one can’t write about everything, and second (because of the first), one has to focus on a few significant topics. The Russian military in the Arctic hasn’t been one of them. 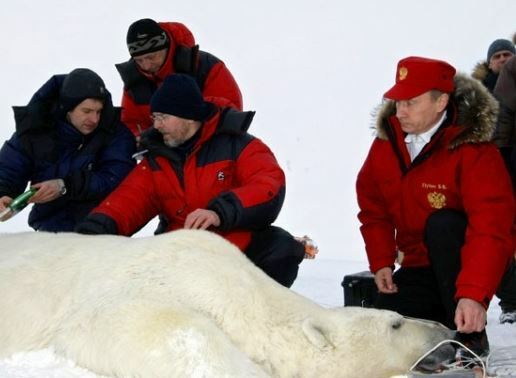 President Vladimir Putin’s interest in the Arctic made news in 2007 when a mini-submarine planted a Russian flag on ocean floor under the North Pole. The Kremlin wanted to stake a symbolic claim to the lion’s share of the Arctic’s potential underwater wealth. The vast, frozen region may indeed have large percentages of the world’s undiscovered natural gas and oil deposits. More than a few observers see Putin’s concern with the Arctic as an effort to extend Russia’s hydrocarbon export-based model of economic growth. The friend-of-Putin state oligarchs running Gazprom and Rosneft would certainly like the Russian treasury (and military) to underwrite their efforts to get at Arctic resources and line their pockets with more cash. It’s an easy place to show Russia’s leader defending national sovereignty and interests. The news stories and press releases track with an established Kremlin narrative about hostile Western powers trying to grab Russia’s natural bounty. All of which brings us back round to the military in the Arctic. During Serdyukov’s tenure, the Ministry of Defense first raised the prospect of basing two army brigades there. In September, Kirov-class CGN Petr Velikiy and other ships sailed the Northern Sea Route into the eastern Arctic. And late in the year, Putin himself was prominent in giving the order to build, or re-build, various Russian military bases in the Arctic. But things have a way of taking ridiculous turns. On 17 February, an unidentified source told ITAR-TASS that the MOD and Genshtab have proposed forming a new Arctic unified strategic command with the Northern Fleet as its basis. The source claimed this Northern Fleet-Unified Strategic Command (SF-OSK or СФ-ОСК) would be a new de facto MD, even if it isn’t called one. The Northern Fleet and major units and formations based in the north would be taken from the Western MD, and put into new groupings deployed in the Arctic, including on Novaya Zemlya, the New Siberian Islands, and Franz Josef Land. Ouch. SK-OSK is supposed to be inter-departmental too, with FSB Border Guards added. The whole thing would report to the MOD, Genshtab, and, at some point, the NTsUOG. The proposal is reportedly with Putin now, and a decision is expected in the coming months. ITAR-TASS last week also reported on a company-sized anti-terrorist exercise in the Northern Fleet. But there’s no “Al Qaida in the Arctic” yet. Only Greenpeace. 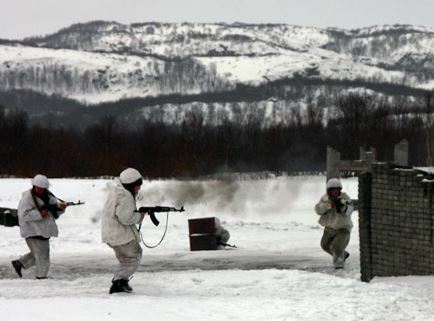 Russia’s Arctic is enormous, and it is likely to be increasingly important, but not necessarily as the next big theater of war. Naturally, Moscow wants to prepare for contingencies, but it’s already prepared and positioned as well as the few other regional players. The money, time, and attention might be better spent on more palpable threats. But, as Byers pointed out, the Arctic seems to be good politics. The NIC has released its latest Global Trends publication. Hat tip to Newsru.com and Igor Korotchenko for taking note of it. As usual, and rightly, the document focuses more on “megatrends,” and less on individual countries. Nevertheless, here are excepts of its forecast for Russia. There’s not a lot new here. But it can’t go without comment. Are the Russians really not integrated into the “international system?” Or do they obstruct because they don’t like the outcomes of the “system’s” operation? Moscow will probably never (at least not for a long, long time) agree with Western views on mitigating a future armed conflict, especially in a former Soviet republic. Russia always evinces more worry about the U.S. and NATO despite the claim of its “serious concerns” about a threat from China. One can’t be sure what’s meant by “pursuing new concepts and capabilities” for nuclear warfighting. The Russians are active developing their strategic nuclear forces for two reasons. First, conventional force problems. Second, U.S. ballistic missile defense. Both require ensuring their deterrent is viable, now and somewhat down the road. Yes, it’s the economy stupid (and demographics too). It’s hard for anyone to say what will happen with Russia’s economy, but the latter’s pretty much destiny at this point. Russia will need more than a better foreign investment climate and WTO to improve its long-term economic prospects. If years of windfall hydrocarbon revenues don’t do it, perhaps open politics, impartial rule-of-law, and serious anti-corruption efforts might be the path to a modernized, diversified, and stronger economy. Are Russia’s external relations with the West and China critical in its behavior as a “global player?” Or does that behavior stem more from the country’s internal evolution or lack thereof? The three possibilities look pretty familiar — pretty good Russia, not as good Russia, and bad Russia. We’ve had the first and second mostly, and a taste of the third occasionally, over the last 20 years. And elements of one and two, or two and three, can occur at the same time. Overall, the Russian discussion in Global Trends 2030 is disappointing. Twenty years after the Warsaw Pact, VTsIOM asked Russians what they think, looking back, about the former Soviet glacis in Eastern Europe. The poll was done 18-19 June with 1,600 respondents in 138 populated areas of 46 RF subjects, and a margin of error not exceeding 3.4%. First and foremost, two-thirds (66%) of those surveyed didn’t know or remember why the Warsaw Pact existed. Asked which time period was most secure, calm, and stable internationally, 55% said the 1960s-1980s, 4% said the 1990s, the Yeltsin era, and only 28% said the present day. Four years ago, the numbers were 47%, 5%, and 34% respectively. According to VTsIOM, those groups most likely to think the Soviet era most secure are Communists, pensioners, the poorly-educated, and non-Internet users. Those most likely to see today as more stable are United Russia members, young people, the well-educated, and Internet users. Eighty-nine percent of respondents look back on the Pact as a defensive, peaceloving, and stabilizing force. Only 6% say it was militaristic, or held Eastern European countries in an unfree condition. Eighty percent think Russia lost more than it won when the Pact dissolved twenty years ago. Ten years ago, 78 percent thought Russia lost more. Finally, those surveyed were asked if Russia needs, or doesn’t need, to create an international military-political bloc like the Warsaw Pact or NATO. Overall, 51% of respondents said it’s needed, 23% said it’s not, and 26% found it difficult to answer. This question was broken out some along the political spectrum without many significant variations. VTsIOM missed the chance to ask if respondents know Russia already has an international military-political alliance. Their answers to a question about the Collective Security Treaty Organization would be fascinating, to be sure. The answers to the questions that were asked are a little surprising and disturbing. Some of them can be attributed simply to feckless nostalgia or the persistence of Cold War propaganda. Some are due to a tendency to equate (or confuse) domestic or internal well-being with the country’s external security situation. Finally, some may come from genuinely perceived threats and insecurities Russians feel today.